The Quills: the forgotten American folk woodwind. 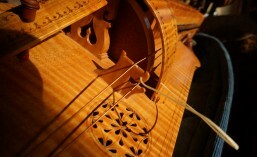 Renaissance recorders were popular throughout Europe from about 1500 to 1650. They were among the most popular “consort” instruments, meaning that they were played in groups (or consorts). A typical consort for renaissance recorders would be made up of one alto, two tenors, and a bass instrument. Michael Praetorius, writing in 1618, expressed a preference for a consort made up of a tenor, two bass recorders, and a great bass. Praetorius also mentions an “ideal” consort made up of 21 instruments, made in 7 different sizes. He illustrated these instruments in his encyclopedic Syntagma Musicum. These instruments were meant to play in small groups at one time–the alto-tenor-tenor-bass consort mentioned above would be played together, just as a tenor-bass-bass-great bass consort would have been used to provide contrast and variety. The second half of the century has seen a huge revival of interest in early music, especially that of the recorder. Most of that interest has been focused on primarily solo instruments such as the baroque recorder. A few dedicated professional builders make reproductions of renaissance recorders, but sadly none of the major companies (even those with recorder lines called “renaissance”) have produced instruments which bear much resemblance to the original. These images are entirely computer generated, rendered with Persistence Of Vision raytracer version 3.0., a free (and excellent) ray-tracer. In 9997, that was pretty cutting edge, but a little dated now. Because the models used to generate these images were based on measurements I and many others have made from the original instruments, they actually make (when printed full size) reasonable working drawings. I have attempted to make them as accurate as possible–usually well beyond the resolution of the rendered image–still, remember that these are reproductions, and not images of the original instrument, with whatever artistic license that implies.